As I have mentioned previously, The Monster and I love a Chinese meal but I’m super conscious of all the salt and msg used in them so I have been working hard to come up with my own recipes at home. One of my major successes has been with this Orange Chicken, which we all love and The Monster actually requests! In a bowl, combine the marinade ingredients. Add chicken and stir to coat. Leave in the fridge to marinate for at least 1 hour. In a pan, heat oil on medium heat. Remove chicken from marinade and cook on all sides until golden brown and cooked through , about 8 minutes. Remove from the pan. Add sauce ingredients to the pan and bring to a boil, mixing continuously, until mixture thickens, about 6 minutes. Add the chicken and stir to coat. I serve mine with egg fried brown rice, but it is just as good with noodles! Chia pudding have to be ones of the easiest desserts to make…ever! And they are sooo versitile, lending themselves to all sorts of fab flavours. This berry one is one of The Monsters favorite flavours. 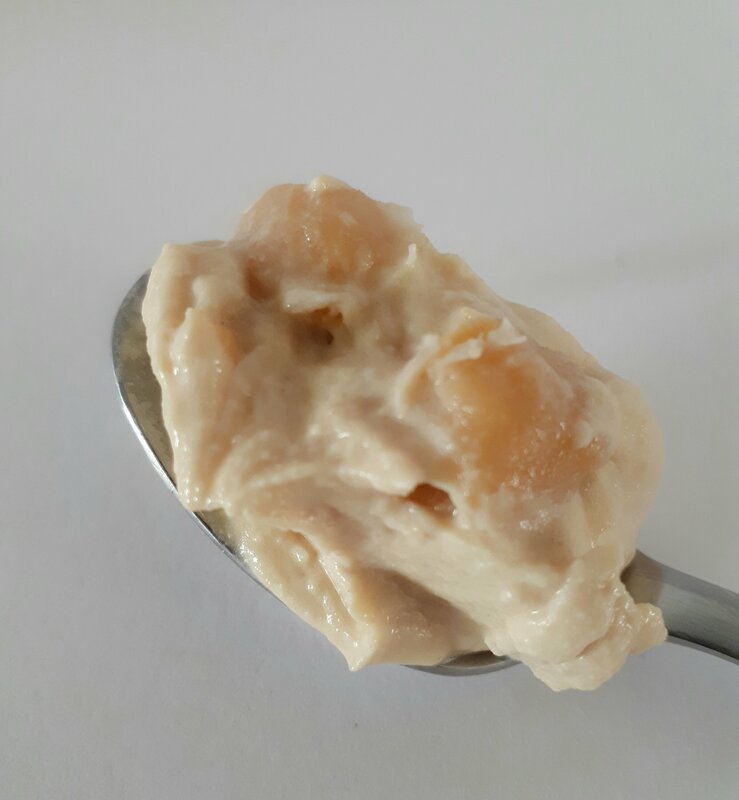 This recipe makes approximatly 400ml of pudding so you can divide it up as you please, it lasts about 3 days in the fridge but unfortunatly can’t be frozen. Place the milk and berries in a blender and whizz until smooth. Stir in the chia seeds and divide into small pots. Pop in the fridge for at least one hour, until thick, soft and delicious. If the berries are a little bitter I add a tiny bit of honey just to sweeten things up. Taste of Dubai is always a highlight of my calender so you can imagine how excited I was when I found out Annabel Karmel was going to be one of the headline chefs this year. When I got the chance to interview her I wasn’t about to turn it down, so here we go…. You have spoken in the past about the fact your son was a fussy eater, but what was the most unexpected challenge when it came to feeding your other two children? I think what surprised me the most was quite how stubborn such young children could be. As a parent, it can be very upsetting and frustrating to lovingly prepare a meal for your child, only to have it rejected without them trying even a mouthful. You come to dread those words ‘It’s yucky, I’m not eating it’. Children can get very worked up over things like visible onions or green bits in their tomato sauce. They also don’t like too many things mixed together so separation of food is important. When my children were little, I found that trying to ignore bad eating behaviour and not reacting when they made a fuss worked well. Instead I piled on the praise when they tried something new or developed a good eating habit. Other good tactics I used that I would recommend to other parents are making sure you don’t give snacks too close to mealtimes and using a reward chart system. Put the chart somewhere visible like the fridge or a kitchen noticeboard and award your child a star every time they try a new food. They can then look forward to a special treat when they collect an agreed number of stars. There are so many pre-made meals and snacks available to parents these days; do you feel it has somewhat taken away the importance of cooking homemade food for children? Not at all. Parents still absolutely think it is very important to prepare home-cooked food for their children. For the last 12 weeks, my Baby and Toddler Recipe App has been the number one paid food and drink app in the UK and many other countries, outselling the likes of Jamie Oliver. The recipe pages on my website www.annabelkarmel.com are among the most popular and my recipe books – all 42 of them! – continue to sell incredibly well. Parents are today very concerned and more aware than ever about making sure that their children’s diet is healthy. They don’t want them to grow up eating junk food, which is high in saturated fat and salt. Some children do have a very narrow diet of foods like chicken nuggets, pizza and burgers, however you can steer them away from unhealthy fast food by making your own healthy versions. For example, I make delicious burgers with lean minced beef, grated carrot and apple. Parents do ask a lot of themselves though and while it is admirable to want to prepare homemade meals three times a day, seven days a week, sometimes everyone needs a bit of help. This is why I have my own range of ready meals in the UK and also Australia. These meals are low in salt, contain at least one of your child’s five a day and introduce children to new recipes like Fish Pie with Salmon and a Potato and Carrot Topping and a Mild Chicken Tikka Masala. What’s the most important thing for new parents to think about when weaning and cooking for their kids? It’s important to understand that while an adult’s healthy diet is low in fat and high in fibre, a healthy baby’s diet is quite different. Babies grow more rapidly in their first year than at any other time in their life and, as such, they need nutrient-dense foods. Dairy foods should be full fat and too much fibre is not good as it can deplete their body of vital nutrients. Iron is also crucial for the normal development of baby’s brain. The iron a baby inherits from his mother runs out at six months, so it is very important to give iron-rich foods from six months. These might include iron-enriched cereal, red meat, egg yolk and lentils. A lot of parents carry on giving only fruit and vegetables for too long, without introducing nutrient-dense protein foods like chicken, red meat or salmon. These foods are very important for you baby’s development. What are your top tips for busy parents who want to cook homemade meals for their children? Plan ahead! It’s the only way to make sure that you have the right ingredients in and that you are using what you’ve bought to avoid unnecessary waste. I thoroughly recommend batch cooking, you can make mini Cottage Pies for example in little ramekins. Almost all of my baby puree recipes can be frozen, so you don’t have to cook every day. Just remember to freeze items in single portions and label them carefully with the ingredients and the date by which they should be consumed. Otherwise you could end up with a freezer full of UFOs – Unidentified Frozen Objects. If you could only choose one of your recipes as your favourite, which would it be? You have been to Dubai a number of times now, but this is your first time participating in Taste of Dubai, what are you most looking forward to about the event? I am really looking forward to the interactive cookery sessions, during which children are going to be cooking along with me. When my three were young I used to get them to cook once a week for the family. They were only 4, 6 and 7 when we started this tradition (which still goes on today) and I think it’s really important that children learn to cook at home. Most children love to cook, it’s an important life skill that will help them make healthy choices. As a bonus, they are also learning maths through measuring and timing, and following a recipe helps with their reading. I hope you enjoyed learning a little more about Annabel, I will be back in a day or two with a new original recipe for your Tiny Tums. These fudgy little morsels pack a secret nutritional punch. Not only do they have no refined sugar, they also contain banana, avocado and (the reason for their name) spinach! And the little ones have no idea, I tested them on The Monster and his friends at our playdate and they were happily eaten by all. Super easy to make, as usual they can also be frozen, wrap individually in parchment paper before freezing. They are also nut free so they’re safe for lunch boxes too. Pre-heat the oven to 180 degrees. In a food processor or blender blitz all the wet ingredients including the fruit and veg until as smooth as possible. Place all the dry ingredients in a bowl and combine. Pour over the wet mixture and stir well o create and thick batter. Line a square brownie baking tray with baking powder and pour the batter in. Bake for 20-25 minutes. Remove from the tray and allow to cool before slicing into squares. 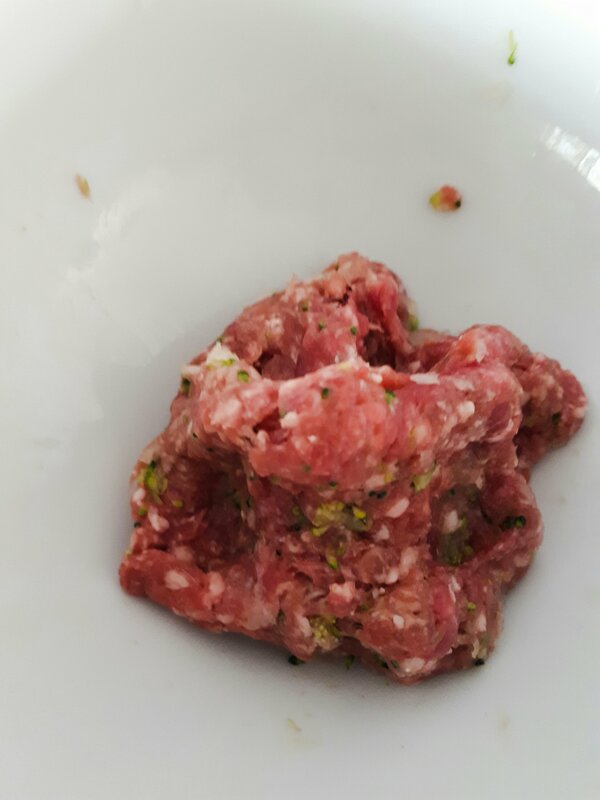 The Monster is not a massive fan of meat unless it’s in mince form so I try to make sure that I come up with a good variety of recipes that use mince. These Minty Lamb and Hummus Pitas are great for the whole family, full of flavour, tender and just as good for lunch as they are for dinner . The best bit, they can be made in around 15 minutes. I make them using mini wholemeal pita but you can easily use full sized ones. We can get some really great fresh hummus here (what with it being the Middle East and all) so I tend to buy it in rather than make it but there are loads of simple recipes online if you did want to make your own. Tip: if you want to freeze these, it’s best to freeze the lamb patties before cooking, this helps to prevent them from drying out. 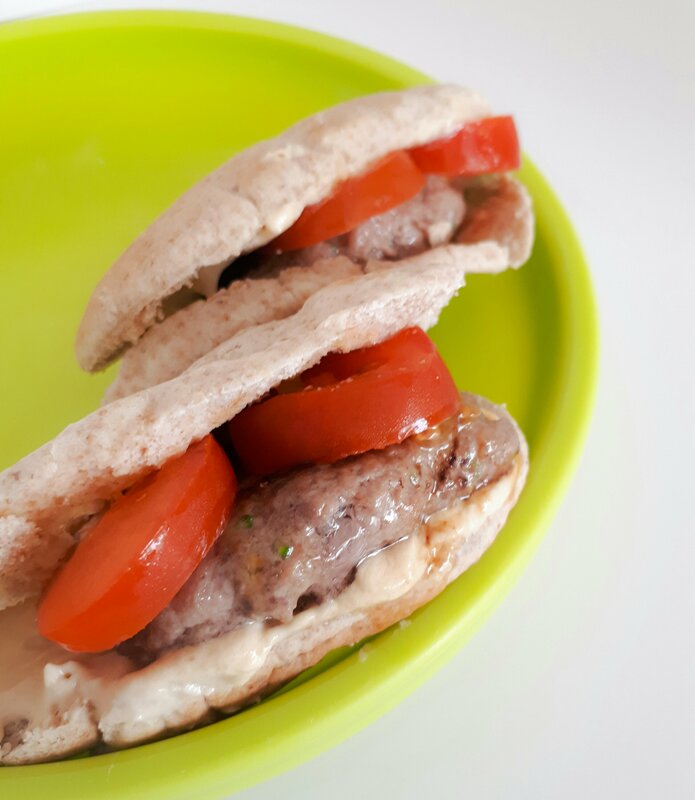 Slice the pitas down the side to create pockets, and pop in a good dollop of hummus, add a lamb Pattie and any extras you want (I love adding tomatoes) and devour.